Completely casual – everyday wear. This is what you will see me wearing as I run to Target or to a friend’s house for lunch. Simple and layered. My LIFE. The full breakdown is here – with some extra options. There are two pieces I want to call out in particular because I LOVE them. First up, we have the J. Jill Tencel Indigo Pullover Top. You don’t have to belt it. You can wear it as it and do just fine, but I like the added accessories because it brings a bit more flare to the look. When shopping on J.Jill, I would definitely size DOWN. Keep that in mind. 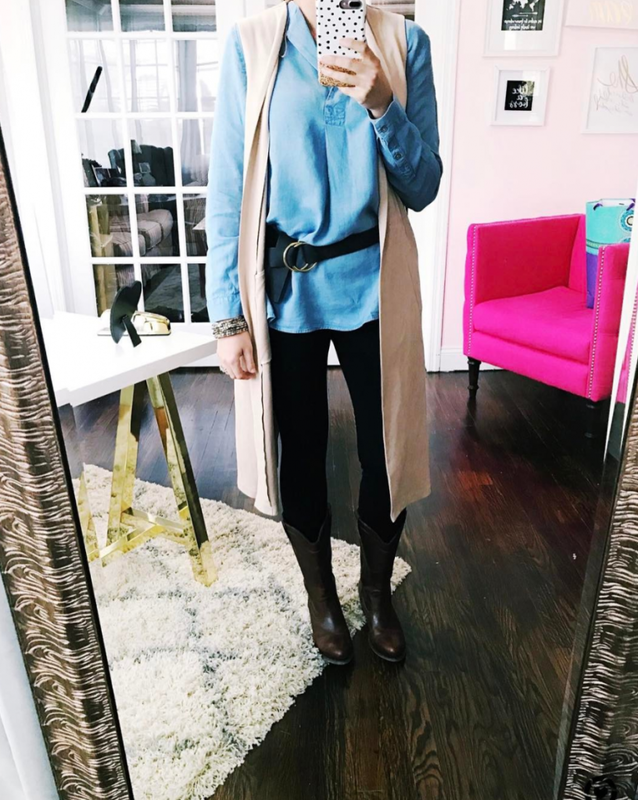 The belt that I have on is from Cabi – the cinch belt. I wear it ALL THE TIME OMG. I can’t say that enough. I also bought it one size larger so I can loop it around itself when wearing it out. To see the rest of the pieces, click here. That Zara vest is no longer available, but I found some similar pieces you can choose from.